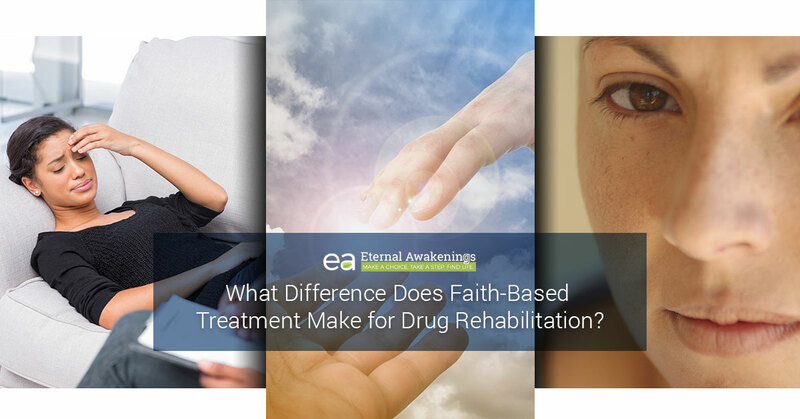 What Difference Does Faith-Based Treatment Make for Drug Rehabilitation? Drug addiction is hard to escape from. Society doesn’t know what to do with it. The courts are at a loss for making a difference. Your family has probably thrown up their hands, helpless to know how to address it. Counseling, psychology and behavioral health services may help, but don’t offer everything needed for recovery. Even the medical community, despite all the advances in modern science, doesn’t have a true cure but simply offers more medication to alleviate your symptoms and cravings. Successful drug rehabilitation requires a combination of all the available methods in order to truly set you free and give you a new chance at life. If you go the secular treatment route, it’s still possible for you to see true progress and achieve sobriety. However, if you leave out the faith-based element from your drug rehabilitation program, you are missing out on one more crucial piece of the puzzle. Faith has played a major role in the addiction recovery of many people, no matter what substance they were abusing. Here are some of the ways that our Christian drug rehab program has seen faith-based treatment make a difference for successful addiction recovery. In Christ, more is possible than apart from him. Drug and alcohol addiction isn’t content to simply take over one little corner of your life and leave the rest alone. No, it invades every area. It affects your relationships, your health, your ability to hold down a job, your ability to hold your family together, your emotions, your safety, and every other valuable part of you. If it can, it will try to take your very life. Since addiction is something that overtakes your whole life, you need something that’s big enough to offer healing in your whole life. Christianity does just that. In the same way that drug addiction is not just an isolated corner of your life, faith in Christ is not just some little tacked-on activity that you do on Sundays. Jesus asks to be the Lord of every area of your life, and when you let him in, he begins to bring healing, restoration, and transformation to every area of your life. 2. Addiction gave you a high; Christ gives you a greater high. One of the hardest parts of letting go of an addiction is the fact that you lose the very thing that used to fill and satisfy you, caused you to forget your pain, and helped you to cope with suffering. You didn’t turn to that substance because it robbed from you—you turned to it because it held out a little bit of relief that allowed you to keep going a little longer. Ultimately, though, drugs, alcohol, and other addictive substances (from prescription pills to sugary foods) are offering you a lie. They hold out a fraudulent source of relief. They tell you that you’ll be happier when you use them, but they take more than they give. If your rehabilitation involves merely “saying no” to drugs, you’ll have a void that keeps begging and craving to be satisfied. It’s always stronger and better to remove a bad thing and then fill that void with a good thing. However, most people are not aware that there is anything available to fill that void, much less anything that is stronger, sweeter, and more delightful. People who have found hope in Christ often declare that the love, peace, and sheer exhilaration they experience in Christ is infinitely superior to the greatest high or romantic encounter they’ve ever known. Jesus doesn’t just leave you to endless emptiness and craving. He comes and fills you with his very life. What if you as a parent saw your five-year-old daughter being pinned down on the pavement by a 10-year-old bully? Your five-year-old is no match for the bully, and every time she tries to struggle to get away, the bully just laughs in her face. What would you do? Would you say to your child, “Try harder! You’ve got this! You have the strength within you—don’t give up hope!”? No, you would go and physically remove the bully from your daughter. After all, you are stronger than that 10-year-old child. And that is the way Christ responds to his beloved. When you find yourself, like that five-year-old child, trapped underneath something that is stronger than you, you need someone who is stronger than that addiction to come to your aid. Have you ever thought to cry out to Jesus for him to come to your rescue? Those who have entered into a faith-based, Christian drug rehabilitation program like the one at Eternal Awakenings have discovered that Jesus isn’t just some remote, theoretical concept in the sky. He is a person. He is strong. And he delights to come to the aid of his beloved. Learn how to access all of the inheritance that your heavenly Father wants to give you when you come to Eternal Awakenings and participate in our drug and alcohol rehab program. We combine Christian teachings with medical treatment, counseling, and practical life skills so that you can find true and lasting recovery. Start the enrollment process by contacting us today.